Looking for a way to get more from your online marketing? This white paper was written for marketers to explore ways to use direct mail to take the heavy lifting out of their online efforts. 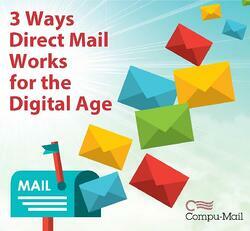 Here, we describe direct mail as another member of the digital marketing team. A white paper about whether or not direct mail works. A white paper about how direct mail works for the digital age – as an extension of your online efforts. Direct mail has become a leading driver of website traffic. When you leverage data analytics to identify customer behavior trends, you give yourself the ability to cherry-pick your direct mail audience. You can choose to only target customers and prospects that are most likely to respond, filtering out uninterested or irrelevant prospects. This results in getting the right customers to come more often to your store or website and spend more money when they do.